During a recent workshop, Swedish innovation studio Topp set out to create a platform for rapid prototyping with design and data. The team decided to take an existing product and retrofit it with IoT capabilities. 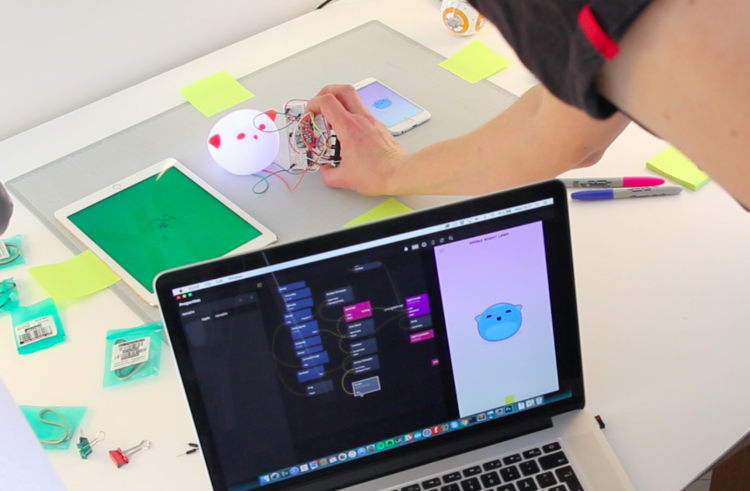 For this, they selected an IKEA Spöka night light and hacked it with an Arduino MKR1000. The connected lamp is capable of reacting to its surrounding environment through sound, motion, and light, while an accompanying app is used to monitor and control intensity. Traditionally data and physical interactions have been difficult to work with, often requiring the availability of early hardware or by constructing mockup data. However, to achieve quick iterations and a higher fidelity experiences for projects involving data, sensors, cloud, and other things typically unavailable to designers early on in projects, we’ve developed a tool called Noodl to help support a better way of working. We’re using Noodl as a foundational tool when we hack our night light. A key function for this hack is to have the lamp and the phone connected to an IoT cloud broker. Bluetooth or other non-routable communications would not work with remote presence, so by using Wi-Fi and a public broker we could build a prototype that also works with multiple clients in a true IoT fashion. The end result was a platform that makes use of cloud and data, which could be employed for a wide range of intelligent home devices ranging from a baby monitor to a morning alarm to a smart dimmer. You can read all about the project — along with instructions, code and components — on Topp’s page here.